Markus Zusak’s The Book Thief is perhaps the biggest Australian bestseller of all time (at 8 million copies, it’s certainly the most-sold Australian book this century). Zusak published his first novel, The Underdog, in 1999 when he was 24, to little fanfare. He wrote two more books for that series about inner-city Sydney, and then wrote The Messenger, perhaps his second best-loved book, in 2002. And then he wrote The Book Thief. Released in 2005, the story of Nazi Germany – which includes death personified as a character – became an international bestseller, and was adapted into a feature film starring Geoffrey Rush in 2013. 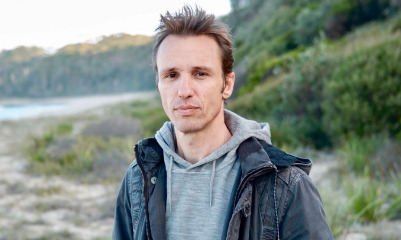 But after writing five books in six years, Markus Zusak hit a wall. He was floored by his success, he revealed in a Good Weekend profile, and endured almost a decade of crippling writer’s block. Thirteen years after the release of The Book Thief, today Zusak releases Bridge of Clay, a novel touted by Pan Macmillan as ‘the most anticipated book of the decade’. Zusak says he wrote, scrapped, and re-wrote the first page of his new book thousands of times. The novel follows the Dunbar boys, five brothers whose mother has died and father has fled. It centres on Clay, the second-youngest of the five, as he helps to build a bridge in the bush. Find out more about The Bridge of Clay.